Today – in Ireland: Dublin ; in USA: Chicago, Connecticut, Floryda, New York, Stamford. 1. 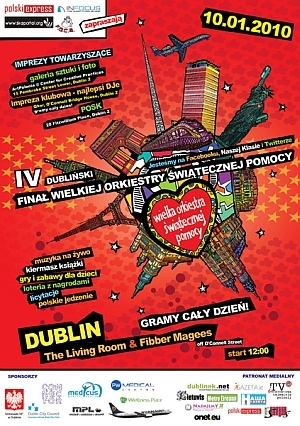 Dublin , Ireland : Great Orchestra of Christmas Charity – WOŚP. The 4th annual charity event organised by the Polish community in Ireland. Activities: 3 stages, 2 clubs, rock-jazz-funk-and reggae live bands, art gallery, ethnic food stalls, kids’ activities, a raffle, an art auction. 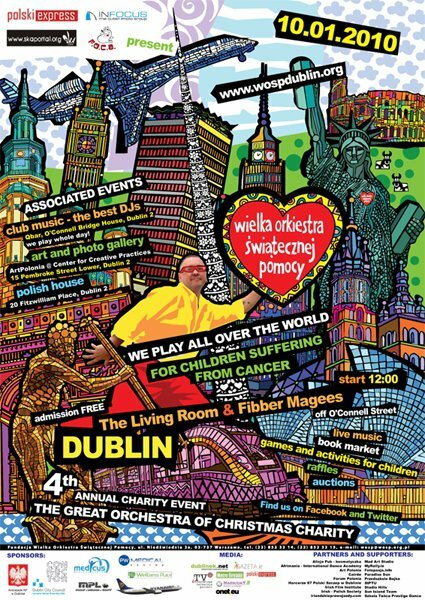 Associated events: Club Music – the best Polish and Irish Djs in Qbar; Art& Photo Exhibition at ArtPolonia Centre for Creative Practices, 15 Pembroke Street – Exhibition opening: Thursday 7th Jan, 7PM; Kids’ corner – face painting, art workshops, storytelling and more – The Living Room, 12pm-3pm. The staff of the Great Orchestra of Christmas Charity Foundation cordially invite you to join us in our annual charity drive when we will collect donations to aid children in Poland. Every January, our collection aims to harness the sense of togetherness, sharing and good will. Join us on the day! For the fourth time, Polski Express magazine and associated organizations and individuals from Skaportal.org, Foca Foka and In-Focus invite you to the grand finale of the Great Orchestra of Christmas Charity. On Sunday, January 10th 2010 we will collect donations for the prevention and early detection of cancer in young children. 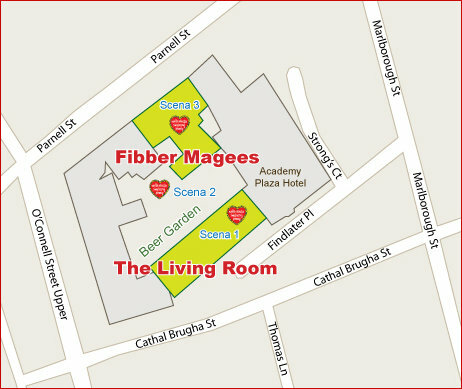 This year our headquarters will be located in the heart of Dublin, at the adjoining Living Room club & Fibbers McGee pub, off O’Connell Street, Dublin 1, a mere two minutes walk from the Spire! The event kicks off at 2.00pm. Entry is completely FREE! Bidding and enjoyment guaranteed until 11pm! The first Great Orchestra in Dublin resounded with rock rhythms, the heart of the second beat to reggae, and the soul of the third soared with jazz and funk. This time, the audience will enjoy an explosive mixture of jazz, funk and hot salsa! On three stages in two clubs/pubs, the best musicians will perform rock & funk legends. There will also be divas singing the Blues, the best DJs, dancers from a salsa group, authentic buskers straight from the streets of Dublin, Polish-Slovak folk musicians, drummers, samba dancers, and many more surprise guests! In between performances, our celebrity presenters will invite bids on the Great Orchestra’s auction items: plates bearing the autographs of Polish celebrities, vouchers for photo sessions, passes to cinemas and theatres, CDs and gifts sponsored by those in political life, the Polish ambassador’s tie and seasoned herrings made by the ambassador’s wife, jewellery, vouchers for beauty treatments, and many more! Every Great Orchestra is also a windfall for art lovers. Great painters, photographers, and graphic artists responded enthusiastically to our call for help. There will be an art and photographic exhibition taking place at ArtPolonia in the Centre for Creative Practices, 15 Pembroke Street. Throughout the day, art auctions will take place – attendees will be able to bid for the work of Polish and Irish artists, including Bartosz Kołata, Agata Stoińska, Katarzyna Gajewska, Anita Kulon, Hubert Szyperski, Sofia Swatek, Tomasz Olejnik and many, many more! Watch a live-streamed TV show on www.iTVe.pl on January 10th, 2010. Polish Embassy in Dublin, Ryanair, PW Medical, My Wellness Place, MPL, Traditional Polish Bakery, Medicus Medical Centre, Dublin City Council, Connector, Zanet Beauty Salon. Partners: Forum Polonia, Irish-Polish Society, Irish Film Institute, POSK, SIPTU, Mad Art Studio, portal irlandzkieprawojazdy.com , MyRally, Szkoła Tańca Prestige Dance, Cáirde, Artpolonia, Harcerze-87 Polski Szczep w Dublinie, przedszkole Bajka, Sun Island Team, Studio Hills, Paradise Sun, Alicja Puk, Solarium Żanet, GAA, sklep meat4u, Tomasz Olejnik Photography, Pictures At Home, Hydraulix Tattoos, HusaRRia Ireland, Microsoft, Fotopasja.info, Agi Photography, BM Car Tuning, Avoca Bar, PC Expert, Lituanica,Underground Dance School, www.salsadublin.com, Fish Maniac , Traditional Polish Bakery, Joanna Szumiec. – the Great Orchestra of Christmas Charity Foundation will collect money for the 18th time to help young children in Polish hospitals. Our aim this year is to help children suffering from cancer. – from 1993 to 2006, the Foundation of the Great Orchestra of Christmas Charity has collected more than 73 million dollars. – The first Great Orchestra in Dublin was held in January 2007. All-day events in the Temple Bar Music Centre helped us raise €21,894.70. In 2008, we hosted the event in the Voodoo Lounge and raised €10,209.95. Last year’s event was held in Le Cirk on Dame Street and raised over €8,000. 2. HQ UNITED STATES FORCES IN THE U.S.
3. Stamford, Connecticut, USA: We play in Stamford. Greetings from the Stamford branch of The Great Orchestra of Christmas Charity. The Stamford branch is led by the Stamford Polish Saturday School in the name of A. Mickiewicz at 360 Washington Blvd. We are starting to collect donations for our 18 Great Final, which is dedicated to funding medical equipment for children with life-threatening illnesses in Poland. Starting January 10Th we will be collecting donations in the Holy Name of Jesus Church. Volunteers — teachers from our school and friends of our school — will be collecting donations. Donations will be collected before and after each mass. We will begin collecting at 7am and finish at 8pm. We would like to remind everyone donations will also be collected at The Holy Name Athletic Club, the Polish Stores in Stamford: Warsaw Deli, European Deli, Pulaski Market, and Seam Market, and the Polish Travel Agencies in Stamford: Silesia Agency near Bedford Street and Express Travel Agency near Sixth Street. In Norwalk donations will be accepted in Polonais Deli. The School of Polish Culture and Language in Bridgeport is also part of our branch of The Great Orchestra of Christmas Charity. Volunteers from this school will also be collecting donations in their church on Sunday. We invite everyone to take part in the charity. Everyone who participates in our charity will receive a red sticker in the shape of a heart. 4. Connecticut, USA: The Connecticut Structure of WOSP. The Polish Club of Central Connecticut State University decided to initiate the local WOSP on its own. We started in January of 2005. We have been doing it ever since. We are being helped by the Polish Scouts as well. Beginning in 2009, we began operating under the auspices of the Polish American Foundation of Connecticut. We organize collections in front of the Polish churches in Connecticut. We “walk up and down” on Broad Street in New Britain on Saturday preceding the Great Finale. We organize rock/blues concerts (bands do not get paid for that) during which the public contributes to our cause. Over the last 5 years, we have collected almost $50 thousand!!! This event is a major task for our coordinating crew as well as the volunteers. The theme of our 6th Finale is: Early Cancer Diagnosis in Children. On Friday, Jan. 8th we are planning on collecting money in Stadion Café (82 Broad Street in New Britain). Saturday, Jan. 9th we will be easily visible on Broad Street in New Britain sometime between 8 and 2 PM. We will be walking up and down the street. We will be wearing our red WOSP t-shirts as well as our identification badges. Later on that day, we will be collecting funds in front of two Polish Churches in New Britain. Starting around 8 PM, we will have a rock/blues concert in Stadion Café on Broad Street in New Britain. Sunday, January 10th will be our big Finale. We will be visible in front of the Polish Churches all over the State of Connecticut, and possibly even in Boston. Remember, you can also make a donation online through our website (there is a paypal link in the right hand corner of this webpage)—it’s is a very secure way of donating. Also, you can write out checks to the Polish American Foundation of Connecticut (it is a non-profit organization—we are operating under their auspices). You can be sure that the money will go directly to Poland. We want to have our counting process entirely transparent. You can come and visit us at the Sloper Wesoly House (27 Grove Hill Street in New Britain) in the evening hours of Sunday, Jan. 10th. The Sloper Wesoly House is our headquarters. 1. Dublin , Ireland : 18 Finał WOŚP – Odliczanie rozpoczęte! Dublin zagra dla Wielkiej Orkiestry Swiatecznej Pomocy już po raz czwarty! Już po raz czwarty, magazyn Polski Express i przyjaciele z organizacji Foca Foka, Skaportal.org, In-Focus i POSK, zapraszają na dubliński Finał Wielkiej Orkiestry Świątecznej Pomocy, który odbędzie się w dwóch sąsiadujących klubach w centrum Dublina, dwie minuty od znanej wszystkim Szpili. W niedzielę 10 stycznia zapraszamy na całodniowy festiwal muzyki, sztuki, kulinariów i zabawy, gdzie nasi wolontariusze i artyści kwestować będą na rzecz diagnostyki chorób onkologicznych u dzieci. W ciągu ubiegłych trzech Finałow zebraliśmy łącznie ponad 40 tysiecy euro – liczymy na Wasze wsparcie również tym razem! Tradycja Wielkiej Orkiestry Świątecznej Pomocy w Polsce doskonale jest znana, dlatego do udziału w tej wspaniałej imprezie charytatywnej zaprosiliśmy również naszych przyjaciół i sąsiadów, by tego dnia – w prawdziwie międzynarodowej atmosferze – wspólnie bawić się i zbierać pieniądze na ważny cel! Bądźcie tego dnia z nami! Odwiedzajcie często naszą oficjalną stronę www.wospdublin.org – będziemy publikować tam uaktualniony program festiwalu, listę artystów i zespołów muzycznych, zdjęcia i filmy video. Oglądajcie również relację na żywo w Internecie – Telewizja Internetowa Polonii www.iTVe.pl pokazywać będzie w dniu Finału, co dzieje się w sztabie głównym w Dublinie oraz innych miejscach w Irlandii! Program imprezy: 3 sceny, 2 sąsiadujące kluby, rock-jazz-funk-and reggae, muzyka na żywo, galeria sztuki i rękodzieła, smakołyki z różnych stron świata, zabawy dla dzieci, loteria, aukcje..
Muzyka na żywo – Jazz – salsa – malowanie twarzy – urban DJs – loteria fantowa – przepowiednie wróżki – rock – bębny – licytacje płyt z autografami – kiermasz sztuki – biżuteria – kabaret – Światełko do Nieba – i wiele niespodzianek! Dom Polski – muzyka, poezja, sztuka – 20 Fitzwilliam Place, D2. 100% charytatywna impreza łącząca wszystkie pokolenia, tym razem odbędzie się w sobotę 01/09/10 w The River Side Manor Paterson NJ. Całość zebranych pieniedzy za wstep plus aukcje prowadzone podczas imprezy zostanie tradycyjnie policzona z publicznością o 12 w nocy i w całości wzmacni konto najlepszej fundacji dbajacej o zycie noworodkow i dzieci. Atrakcyjne wystepy na żywo m.in: Anny Tanskiej, Tomka Popławskiego. Scena podziemna to przekroj muzyki niezależnej poczawszy od punk rocka kończywszy na metalu. Amerykanscy i Latynoscy gosciei z najlepszymi polonijnymi formacjami grajacymi niekomercyjnie! Tylko raz w roku jedyny FINAL. 10 Stycznia, 2010 roku zapraszamy do Polskiego Klubu “Polonez” w North Lauderdale na Florydzie. Od godziny 5PM będziemy kwestować aby wspomóc XVIII Final Wielkiej Orkiestry Światecznej Pomocy. Zapraszamy wszystkich do odwiedzenia polskiego klubu, a czekaja na Was “serduszka” Wielkiej Orkiestry Światecznej Pomocy oraz każdy będzie mógł osobiscie wspomóc Fundacje wrzucajac do oryginalnej puszki XVIII Finalu WOŚP. Puszki otrzymalismy od sztabu w Nowym Jorku. Dziekujemy! 4. Chicago, USA: Fundacja Kopernikowska zaprasza!!! Fundacja Kopernikowska zaprasza na XVIII Finał Wielkiej Orkiestry Świątecznej Pomocy!!! Niedziela, 10 styczen 2010, godzina 3:00pm. 5 godzin wspólnej zabawy!!! Zagrają dla nas chicagowskie zespoły takie jak : Rebel Roots, Johnny Comes Late, Maggie D. Feat. Overtime, The Hookups oraz wiele innych. Liczymy, że będą Państwo z nami i wspólnymi siłami wesprzemy polską onkologie dziecieca! Witamy w sztabie Wielkiej Orkiestry Świątecznej Pomocy przy Polskiej Szkole Sobotniej im . A. Mickiewicza. Zaczynamy 18 wielki finał, poświęcony po raz drugi onkologii dziecięcej. 10 stycznia ( niedziela) kwestujemy pod polskim kościołem Holy Name of Jesus Church. Wolontariusze – nauczycielki z naszej szkoły oraz nasi przyjaciele będą zbierać do puszek pieniądze na ratowanie życia dzieci przed i po każdej mszy. Zaczynamy o 7 am. i kończymy naszą kwestę o 8 pm. Przypominamy , że równocześnie trwa kwesta w polskim klubie Holy Name Athletic Club przy Atlantic Street, w polskich sklepach w Stamford: Warsaw Deli, European Deli, Pulaski Market, Sezam Market, w Norwalk w Polonais Deli oraz w polskich agencjach w Stamford: Silesia Agency przy Bedford Street i Travel Agency przy Sixth Street. Do naszej kwesty włączyła się również Szkoła Kultury i Języka Polskiego w Bridgeport- wolontariusze z tej szkoły będą kwestować pod polskim kościołem w Bridgeport w niedzielę . Zapraszamy wszystkich. Przyjdźcie na naszą kwestę . Mamy dla każdego piękne czerwone serduszka Wielkiej Orkiestry Świątecznej Pomocy. VI Final WOSP w Connecticut przed nami – 8, 9 i 10 stycznia 2010. Kolejny, VI juz Final WOSP przed nami…zostalo nam juz tylko kilka dni. Liczymy na Wasza pomoc 🙂 Mozecie rowniez dokonywac wplat poprzez ta stronke internetowa. Kwesta w Stadionie Cafe (82 Broad Street) w New Britain. Kwestujemy na Broad Street w New Britain od godzin porannych do mniej wiecej 2 po poludniu. Nastepnie kwestujemy pod dwoma polskimi kosciolami w New Britain. Wieczorem: koncert Wielkoorkiestrowy w Stadionie Cafe przy 82 Broad Street w New Britain; rownoczesna kwesta w klubie Ibiza w Berlinie. kwestujemy w wielu miejscach w naszym stanie gdzie zbierac sie bedzie Polonia. Liczba miejsc do ktorych zostana poslani nasi dzielni woluntariusze bedzie zalezala od liczby woluntariuszy. Im bedzie Was wiecej, tym wiecej dzieciakow w Polsce bedziemy mogli uratowac!!! Na pewno bedziemy w New Britain, Hartford, Bristol, Southington. Byc moze dotrzemy rowniez do Bridgeport czy Middletown.